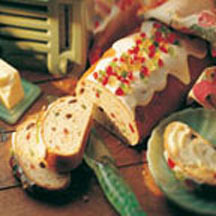 Stollen, a festive loaf-shaped German yeast cake filled with candied and dried fruits and nuts, and covered with powdered sugar or icing, is traditionally eaten during the Christmas holiday season. Scald milk by heating to 180°F (85°C) on stove. Add sugar, salt and butter, stirring to blend. Cool to lukewarm. In a large bowl, sprinkle yeast over warm water. Let stand about 5 minutes until bubbles form; stir. Add eggs, cooled milk mixture and 2 cups of the flour. Beat by hand or with mixer until smooth, about 100 strokes or 1 minute. Add fruits and nuts; blend for 30 seconds. Add more flour, 1/2 cup at a time, until a soft dough is formed. Turn dough onto lightly-floured board; knead until smooth, about 3 minutes. Place in buttered bowl, smooth side down; turn dough over. Cover. Let rise in warm place until doubled, about 35 minutes. Punch down dough. Shape into 1 large or 2 small stollen by patting dough into oval shape(s), pressing out bubbles. (Two ovals will measure about 12 inches long by 6 inches wide) Spread with 2 tablespoons soft butter. Fold in half, lengthwise, and curve into a crescent shape. Press folded edge firmly with heel of hand so stollen will not pop open during baking. Let rise until doubled, about 20 minutes. Bake in a 350°F (175°C) oven for 30 to 40 minutes. Cool on a wire rack. Frost with favorite powdered sugar glaze and decorate with fruits and almonds.